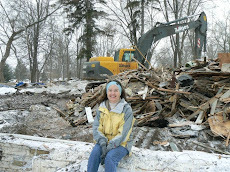 The story of tearing down a 100 year old house, and building it again--just like my life-- in a green and nature friendly way. I am in the fortunate position of being able to afford to build myself a new house (well...perhaps myself and the bank). Having been to several 3rd world countries and knowing that there are lots of people in the world who don't even have housing, I felt a few pangs of guilt about this. I had a decision to make: rehab the old or build new. The cost to rehab my old house was going to be substantial. It was October of 2009. 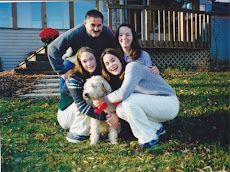 My husband had passed away in August from liver cancer. I was in the depths of grief and sorrow. I needed a project. I decided that if I had to plunk down a lot of money anyway, it was better to build new. I also decided that if I was going to build new, I was going to build green. My new house will be both beautiful and "green". I will share the journey and the adventure with you. Its been a tough couple of weeks for spending money. There are so many expenses to building a house that you do not fully appreciate until you are in the midst of the process and cannot turn back. One of these is the cost of the well. Way back nearly two years ago when I decided to tear down the house and rebuild, I was told I would need to cap off my old well because the new house would be covering it over. This cost about $900 to do. The cost for the new well was contracted in to be about $5000. I was told that sometimes they needed to dig a deeper well, and I would have to cover that cost. Being, by nature, an optomistic soul, I figured I had a good chance of getting a well that was the approximate depth of my old well which was 108 feet deep. What no one told me was that the DNR (the Department of Natural Resources) in Wisconsin instituted some new regulations regarding wells in Winnebago County where my property is. This a happened a few years ago. In one township of Winnebago County, there has been a problem with arsenic in the water. I would agree that this is a bad thing. However, in my area, near the lake, which has a high water table, there has never been a problem with arsenic. In fact, I remember getting the well tested when this problem first cropped up in the county (it was required), and the water was fine. The new regulations allow for shallow wells, less than 100 feet, but no wells are to be dug in the acquifer that is 100-200 feet, if there is sandstone because it can potentially cause the formation of arsenic. The DNR did not want to have to designate only one township as being bad, so they decided to make the ruling for the entirety of Winnebago County. So they dug my well. There is no water at less than 100 feet, and there is sandstone in the aquifer at 100-200 feet. This means they had to dig down to the next aquifer. Mind you, they charge per linear foot. Want to guess how far down the next aquifer is? Answer: 400 feet! So...my $5000 well has turned into a $15,000 well. I was talking to the well guy on the phone a few days ago while I was riding in a car, asking about the final pricing, etc. I had been nauseated and sick that day and so my sister was driving. I suddenly felt sick to my stomach again, told her to stop the car, handed off the phone, and started vomiting out of the side of the car. My sister explained to the well guy that I would have to call him back later. He apologetically said, "I hope she is not getting sick over what we have been talking about...". In actuality no, but it was nice to feel that I caused him some anguish too! I am hoping, after spending $15,000, that I have great tasting water without a lot of iron it. My prior well had bad tasting water with lots of iron in it that caused rust in the toilets and baths. I also love my travertine floor. Being a neophyte to the house building arena, I had never heard of travertine stone before. I had started to look at tile for flooring almost a year ago now. I had some good possibilities, but none that I was totally sold on. At one point, I decided I should just use what Lowe's or Menard's had in order to save some money and to dress it up with some type of special tile or mosaic border. That brought me to Ann Sacks which is a specialty tile store that they have in Kohler, Wisconsin. I was visiting Kohler one weekend and decided to stop in. There I met Todd Graf, a salesperson at the store. Ann Sacks has some very expensive tile and I wasn't even thinking that I could afford it. However, I figured that I might be able to find some interesting mosaic tile border that would be more affordable and match with a low priced Lowe's tile. Todd showed me a beautiful mosaic, but at the same time he said, "I know the perfect stone that would go with this." He pulled out a piece of cream colored stone that was about 4"x 4". I thought the two looked great together. I showed him a copy of my house plans (which I always carry in my car during this house building process). He loved the house plans and asked who was building the house. I told him, "James Mathusek, from Gallery Homes." Well, lo and behold if he didn't know Jamie and Billie Jo and thought highly of them. He also knew the feng shui person I had consulted, Jackie Patricia. Its a small world. He offered me a great price and I decided to buy the mosaic and the travertine stone that went with it. This was maybe in January or February with the idea that it would be done in April. After a few weeks, I ordered a couple of larger pieces and was quite shocked at how different it looked from the 4"x 4" sample. I wasn't sure how it would turn out or even if I would like it. Travertine is a soft limestone that is formed underground by rivers and hot springs. It is known for the pits and holes in its surface. I did not know this until I had already purchased it! My first thought when I saw it was, "It looks like it has a disease!" It had been a spur of the moment purchase, and I was having some buyer's remorse.. When I brought my concerns up to Todd, he assured me that they would fill in the pits and the holes with grout. There was a choice between gray and brown, and Jamie showed me a finished tile with both colors. I chose the gray. Below you will see the tile in its natural form (which my friend, Kelly, loves and wants to do her kitchen in the travertine after seeing mine in it unfinished form), and you can see pictures of the finished floor. Since it is a natural stone with a porous surface it will need to be sealed periodically in its lifetime, but, on the other hand, it should last a lifetime too. For trivia buffs: Travertine stone was used to build the coloseum in Rome--look how long that has lasted! The Front Door is In! At long last, after being ordered a couple of months ago and being on back order for at least 4 weeks, my front door came in!! The side lights, door, and transom window come all as one piece. The door is made by Thermatrue and is a fiberglass door that will be stained a walnut color. Luke, the mason, also showed up after a hiatus from working on my house. He put the stone on the peak of my house (which was a bear of a job, according to him, and precarious). Life is looking good. I am hopeful that the house WILL be completed after all! (Still not sure when exactly, but soon, I hope!). I just wanted to share some pictures of my beautiful wood floor--which I fondly refer to as the find of the century. My builder had taken me up to New London, WI. several months ago to the Northside Planing Mill to look at wood planking for flooring. When I first arrived, Dan, the owner, showed me some nice oak, and maple. They plane all of the wood there themselves. Plus, they had me pick out some sample pieces of wood trim to decide upon later. Towards the end, he said, "Jamey told me that you were building green, so I thought you might be interested in this wood. Its a reclaimed maple, and this particular type is called birdseye maple. I finished off a couple of pieces so that you could see how it looks." He said that he had purchased a large amount of it about 10 years ago, and had saved some for a potential future project at his own house but had decided that it wasn't going to work out. Apparently, his wife was not interested in it. The wood had come from a 100 year old woolen factory in New Jersey. Dan re-planed it at his shop, taking the top 1/8" off and making it into a tongue and groove planking for modern flooring. My first impression of the wood pieces he showed me was, "These look beautiful!" Cautious soul that I can be, I said, "Let me take them home and look at them, and I will let you know." He offered a great price per square foot ($4.50). It wasn't too long after I got them home that I said to myself, "Are you crazy? What is there to think about? Get the reclaimed maple flooring!" It was my friend, Cindy, one of the xray techs at work who came up with the phrase, the find of the century, after she took a look at the sample pieces I showed her. She has some birdseye maple in her home, too. The challenge was whether there would be enough to cover the space I wanted it in since I decided I wanted it in the sunroom, dining room, kitchen and office. Jamey and Dan came up with the idea to use a walnut border around it to extend the coverage of the reclaimed maple--another gift! I thought it was a great idea. I was a little nervous about a month ago when Dan called from the planing mill. He wanted me to stop up there to check out the unfinished samples of the reclaimed maple. Its about a 45 minute trip. I asked, "Is something wrong?". He said, "No, I just want to make sure you are going to like it before it gets put down as a floor." It was a beautiful fall day, so I took the ride up to New London to his planing mill to look at it again. All along the way, I was worried he was going to take the floor away from me. And the other half of me was worried that maybe the pieces he had showed me originally were the best pieces and the rest had major defects or something. So, I arrived at the mill. He had a large portion of unfinished wood laid out on the floor. I studied them and said, "Dan, they look just as beautiful as they did before. I still want them." He pointed out the variation in color and the original nail holes that were square because the blacksmith hammered out each nail back then with a square point, not like the mass produced factory made ones that we have today. "Yep, I still love it", I said, " Blemishes and all. It needs a home!" It had been lying up on a shelf for about 10 years in Dan's shop. He happily sent it down to Oshkosh for my house once he was assured that I appreciated it. I may be biased, but I think it is the most beautiful floor I have ever seen! The boarded up front entry, waiting for its door! The Good News: I am so excited about my house!!! It is absolutely beautiful and exceeding all of my expectations! It is like having Christmas every time I go over there! I just saw my newly installed, reclaimed maple flooring with a walnut border and its gorgeous--and it doesn't even have its final finish on it!. Such character of the wood--I love it. I am praying that they have enough to go into my small office too. They weren't sure if they would the last time I spoke with them. The tile looks wonderful too. I had purchased the tile way back in February, based on a 4" sample. I was kind of shocked when it got shipped to me in the 12 x12" size and I could see all of these large crevices and pits in it. I wasn't sure if I would like the finished product, but I do. They fill in most of the cracks and pits with the grout and it has a wonderful depth and texture to it. A matching mosaic tile creates a border in the front foyer. The wood trim has a rich and wonderful color to it, and the stone and the siding and the dryvit look fantastic together. Plus the ceilings--they're fantastic too! Lots of beautiful angles and arches in the architecture--I am so blessed. I have had so many wonderful people to help in this process to make it such a beautiful house. I cannot thank them enough. I was especially touched by Bev at Lowe's in Oshkosh this weekend. I had a deadline to pick out the tile for the bathroom. She works in the flooring department there, and has a degree in interior design. She took all the samples I had brought in of the travertine stone, the color of the woodwork and the color of the paint, and helped me come up with wonderful tiling for my shower in a short amount of time. What a godsend she was! The Bad News: The front door and the transom window above it were due to come in this week. When Jamey, the builder, called on it, he was informed it was on back order. Hmmm, it would have been nice of them to have told us sooner. So...the parade of homes is October 20-23, and the door to the house will not be here until the 28th. I asked if something temporary could be done, and the answer is no. The framing for the door, the transom, and the door itself , plus the stone going around it, all work together and can't be done in a temporary way. My beautiful home has been taken out of the parade of homes for the fall. I was so sad. I was almost getting a house for my birthday on the 23rd. I was looking forward to being able to say that. However, my house will be in the Spring parade of homes, guarenteed. And, I will be able to move in when my house is completed. I also still have moments of aching and sadness that I am doing this process alone, without a husband to share in my trials and joys. Although my friends and family have accompanied me to the house on occasion, mostly its been my journey alone. Like tonight, when I saw the installed maple flooring for the first time. It was just me in the house, saying ooh, and aah. I wish I could look forward to when "we" will move in, instead of when "I" will move in. I have never had to be this independent before and I am not quite sure what to make of it. The stone is going on the house! The weeds are growing...like weeds! ﻿﻿﻿﻿﻿﻿ Yes--I am finally back blogging. Summer is way too busy. The house building is definitely moving at a faster pace now. The parade of homes date is set for 10/20 through 10/23. How exciting! I will officially have the house on my birthday, 10/23! Its amazing how step by step it is nearing completion. I agonized over my decisions on the house colors for the exterior. I had 4 things to decide upon: : stone, siding, dryvit (stucco) and trim color. In my case, I happened to choose what was labeled as "tan" for the window color but really is an almond/light yellow color. That it turn determined the choice of the soffit color which in turn determined the trim color since they are usually one and the same. I now understand why most people stick with white for the window/soffit/trim color: IT MATCHES EVERYTHING. This is not the path I chose however! I decided I wanted something different besides white. Little did I realize at the time that it would narrow down my choices for siding, stone, and dryvit colors, since my trim color doesn't match to much. With the help of Jamie, the builder, and Jason, the guy at Fond du Lac stone and brick, I was able to come up with a good match with the stone. To come up with a dryvit color, I personally when to the place that sells it, then compared nearly 37 colors with a sample of my soffit. I took those that seemed to be the closest match to the stone company, Fond du Lac stone and brick. As you can see in the pictures, the colors look great together--whew! A funny thing happened when I was first investigating trim colors. . The plan calls for something called Azek trim which is durable and made out of PVC. I was imagining all sorts of different colors for this and how it would affect the other choices that I had to make. I decided to check out the website on the Azek trim. So, I clicked on the website http://www.azek.com/ and clicked on " trim". Then I clicked on "colors". What appeared to be a white screen showed up. I was puzzled. "Where are the colors?" I thought. "There must be some mistake!" So I clicked on another section that they had for materials used in making decks. On the page appeared 12 different colors. I clicked back to the trim section. White. No colors! I had to laugh. I decided that this was the universe's answer to my poor decision making--I only get one choice when it comes to trim. Actually, as it turns out, the trim gets painted to the color of your choice, and in my case it will match the soffit color (the almond color). To my blog followers: I apologize for the hiatus. It's summer! That means less time to get to the computer. The Neilsen Manor, as we fondly call it in our family, is coming along slowly but surely. The windows are nearly all installed now (except 2). There were a couple of mishaps. Apparently, when the windows were being loaded in the lumbar yard to be shipped to my house, someone ran into the windows and several were broken. Back to the factory they went. Then they were installed. However, the builder found a couple of defects (something to do with the weather stripping) on a couple of the windows and is waiting for them to be fixed. Progress in other areas of the house building has occurred too. What is labeled as the "rough in" for the electricity, plumbing and heating systems has been completed. It was so much fun to see the windows get in. For several months, the windows were covered with paper and now the light shines in and I can appreciate all the views. My favorite view is from the great room and from the master bedroom located on the floor above it. The master bedroom has a stair step ceiling coming up from either side. That, combined with the view, will be spectacular. I realized after visiting my sister and brother in law in Seattle, that the ability of a window to keep out the cold is a lot more important here in Wisconsin. The real test of the windows will be in the midst of winter with a cold, northeast wind blowing off of an icy Lake Winnebago. There are certainly a lot of choices for windows. I went with what the builder recommended. He is working with a new supplier. The windows are from a company called Weather Shield. Their windows are made with Zo-e-shield glass. Mine is called Zo-e-shield 6. The difference between that and Zo-e-shield 5 is an extra pane of glass. The following is a quote from their website. "An extremely energy efficient insulated glass system is now available. It was introduced at the National Home Builders show in Orlando in early 2007. All Energy Star requirements are substantially exceeded by this new technology. We have literature available and hands-on demonstrations available for anyone interested or as part of a Green-related meeting or presentation. Just give us a call to set up a demonstration in our showroom, or to schedule an off-premises presentation. Zo-e shield 5 is a combination of a new Low-E3 coating with EasyCare and an Argon/Krypton gas fill. The combination of these elements along with a warm-edge spacer system gives our customers one of the highest performing insulated glass systems on the market today. In addition, the outter glass is double strength, which is more rigid, and minimizes stress cracks as well as sound transmissivity. This technology is an exclusive for the Schield Family Companies (Visions, Peachtree, Vetters, Crestline, and Weather Shield). Thicker exterior glass for more durability, less flexing and distortion due to wind loads, fewer stress cracks,less noise transmissivity, and more overall window stability. High performance Zo-e Shield 5 insulated glass includes Low-E cubed (triple coating)." Other more common names in the window industry would be Anderson and Pella. Usually my builder has used Anderson, but Weather Shield has been promoting their new product heavily in our area and gave him a good deal. I talked with the window specialist at Omni Glass in Oshkosh, Connie, who has been in the business for a long time. She felt the new Weather Shield product was very comparable to the other more well known names. I will have to give you an update this winter. Burning questions that I have been pondering: where to put the TV? Over the fireplace? Build shelving on either side of the fireplace and put it in there? Or keep the space open on either side and get a TV on a stand that is portable--that way I can have it change position if I need it too. The other burning question is where to place the half wall(s) between the kitchen and great room. There are 3 arched openings separating the kitchen and great room. The plan calls for 2 half walls/cabinets on either side of the central opening. Colleen's contention is that we will always run into the back of a couch with that set up. She is promoting putting the half wall in the center opening. Then the couch will lean up against it. I am still pondering that one. There are about a million and one decisions to make when building a house! Yeah! The roof is going on the house!After taking about a month to make a decision on the color, its finally going up. Fortunately, I am liking the color. It is one of the more common colors on roofs now. What was holding up the decision was not so much the color as the fact that I was trying to make a decision on the siding, the stone, the stucco, and the trim and wanted the roof to match (obviously). The roof shingles are an asphalt shingle called "weathered wood" and are a light brown. Ultimately, I decided I could go ahead with the roof even though I haven't made final decisions on all of those other pieces of the exterior. The color I have chosen should match with most things. Delaying on the roof means that I now agnoze over the water that comes in every time it rains. The next step is the windows which should be coming soon. I went with asphalt because it is cheaper. Its not really a great option in terms of being green since its made from petroleum products and its difficult to recycle, but I am hoping that by the time the house is ready for its second roof that that the shingles will be a lot easier to recycle than it is now. I felt sorry for the roofers this week though. The annual outbreak of lakeflies started over the weekend. These are 3/4" green flies with wings, but no teeth, who hatch for 2 weeks in May of every year. They hatch, then mate, and then die. They are important for the ecosystem of Lake Winnebago because their eggs (which they lay in the water) provide food for the sturgeon fish that inhabit the lake. The lakeflies come out in droves and are a nuisance for 2 weeks. They were horrible this week when I went to visit the house. Thanks to the roofers for putting up with them! Green decisions re: roofs: If you wanted to be really green, you could go with a sod roof (think Al Johnson's restaurant in Door County). Another nice option is a metal roof: it lasts a super long time (50 years) and it can be recycled at the end of its life. Its made primarily from recycled steel as well. The market share for metal roofs has tripled in the last decade (to about 7% of the market). The downsides? It costs twice as much as an asphalt roof and the metal may interfere with cell phone signals. A third option is a recycled roof made from 80%recycled plastic and rubber with the other 20% being made for limestone fillers for added strength.The company that makes these is Eco Star. The roofs are beautiful but come at a cost: about 3x the cost of an asphalt roof. There is also the option of a clay or concrete tile roof. These last over 100 years or more. However, they are heavy. Plus, they have a harder time handling extreme cold without cracking. Spring is slowly arriving. Last weekend it hit the 70 degree mark while this weekend there were a few snow flurries. I know I have been slow at getting the blog postings out of late. The actual building of the house has been on pause mode while I have furiously debated to myself what colors and stone to put on the exterior and the what the color the roof should be. Its such a permanent decision. 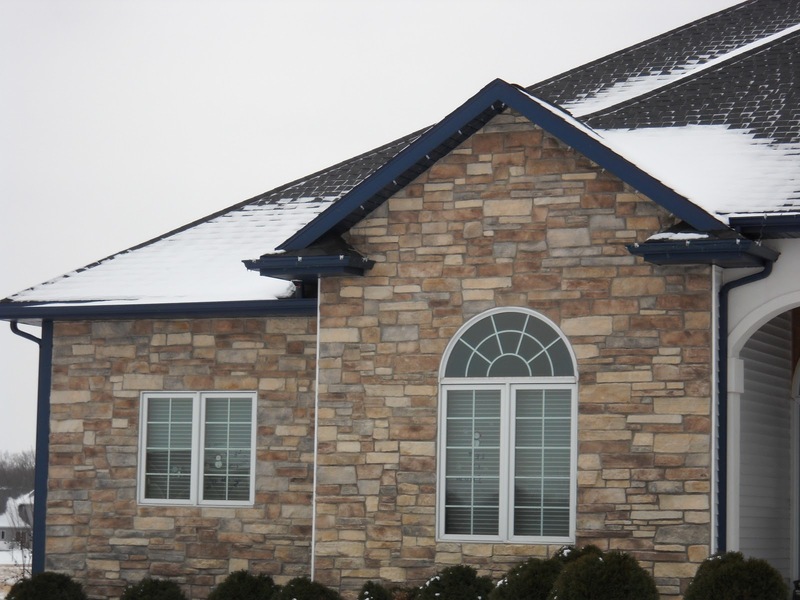 I am now debating between using some real stone on the exterior (about $2.50 extra per square foot from the Fond du Lac Stone company) instead of the cultured stone. 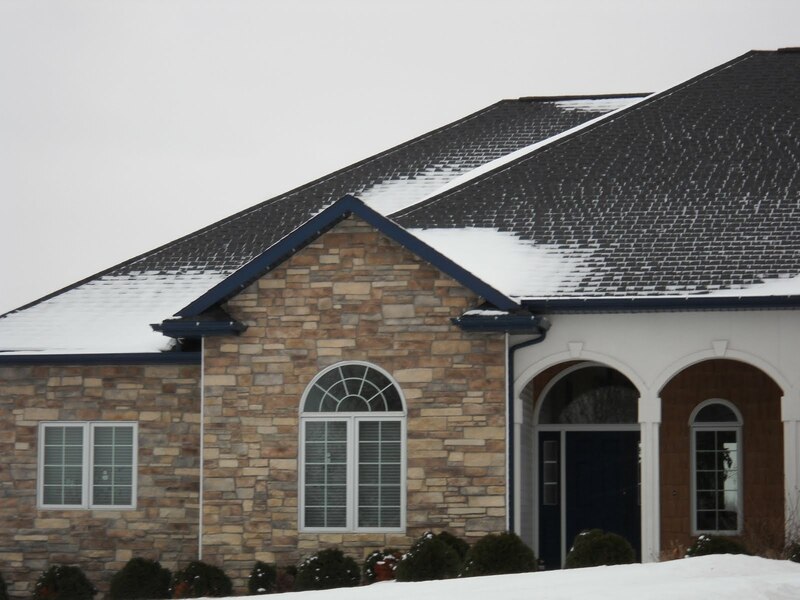 Cultured stone is ground up gravel stone that they add color and shape to in a factory. The pictures on the last blog are cultured stone. Here is a picture of real stone. The stone I would use comes from a local quarry in Fond du Lac. Real stone actually has less color than cultured stone; however, there is a different "energy" coming from real stone, which I like, because it comes from our mother earth. The other event of the week was that a sheriff pulled into the driveway while my brother-in-law happened to be out there. I wasn't home yet, but my sister was. She saw the police car. Her first thought was: "Oh, God. Kristin has gotten too many speeding tickets!" This was not the case, however. It turned out that the owners of the empty lot next to me want my pier moved off of their property. I wasn't aware that it was even on their property. They threaten to take me to court if I don't move it soon. I called the sheriff and was appropriately apologetic and plan to have it moved ASAP. At the time, there was still ice on the lake. Now the ice has melted, so I have arranged for someone to put the dock into the water within the next couple of weeks. One of things I have been researching in terms of alternative forms of energy is geothermal, also called a ground source heat pump. Somewhere between 4-8 feet below the surface of the earth, the temperature maintains a nearly constant temperature of about 50 degrees farenheit. Here in Wisconsin, you have to dig down about 8 feet to reach far enough below the frost line to achieve that constant temperature. In traditional heating and air conditioning, it is the air in our homes that is either heated by natural gas or propane or cooled using freon and electricity. In geothermal, it is the heat stored in the earth that is transferred through pipes containing a water and ethanol solution to heat your home. For cooling, the hot air from your house is transfered back into the earth. The unit that does this is called a heat pump that uses a compressor and a blower motor to heat and to cool the air based on what the thermostat tells it to do. The geothermal heat pump operates using a small amount of electricity to transfer the heat back and forth from the earth to your home. The technology is the same as that used in refridgeration (only operating in reverse to heat your house) and has been around for many years. There are several ways to install the piping. The cheapest is called a pond loop. This can be done if you have your own pond in your backyard. The Department of Natural Resources (DNR) in Wisconsin does not allow geothermal piping in any public waterways, such as Lake Winnebago. The pond loop option is out. Geothermal piping could also be attached to a well (but its sealed from the groundwater) but they don't allow that either here in Wisconsin. The other types include a vertical loop and a horizontal loop. The horizontal loop is cheaper than the vertical loop but requires more land. * Its super efficient. An efficiency rating is the ratio of heat generated versus the amount of energy used to produce it. The top efficiency rating of a furnace is about 95%. Geothermal systems have efficiency ratings of 400-500%. * It is quiet--there are no noisy "on" cycles with blasts of hot or cold air, the temperature remains constant. * The heat that is formed when running the compressor motor is recaptured and used to heat water in a holding tank. This is then added to your hot water tank. This means your hot water costs are reduced. Some people choose to use the water in radiant floor heat too. *Geothermal heat pumps last an average of 25 years in comparison with convential furnace units that have an average lifespan of 13-15 years. A filter is changed yearly which costs about the same as a furnace check ($79.95 for the service check, $38 for the filter): quote from Black Haak heating. * The ground loop piping has an indefinite life expectancy. Barring an earthquake, you will not have to replace it for at least 100 years. It does not leak. The pipes are joined by thermal fusion. The substance it is made out of is the same substance that natural gas pipes are made of. So the big question, of course, is cost. A number of people I had talked to, including people in the business of HVAC, said that the cost was prohibitive. However, I decided I should research it further before making my final decision. I really would like to use alternative energy to heat and cool my house. I had picked up a brochure on geothermal from Black Haak Heating at home show a couple of years ago, and had remembered talking to the owner, Jim Haak (very personable and easy to talk to), about it. I have had about 4 bids on installing conventional heating and cooling systems. The bids ranged from about $12,000-$14,000 for your basic high efficiency furnace and airconditioning unit with the ductwork installation etc., to approximately $15,000 to $17,000 if I added in things like zoned heating. Installing geothermal (which include both AC and heat) and its ductwork into my home will cost about $15,000. The cost for the installing the horizontal ground loop piping is about $6000 for the 6 ton unit that is needed for my home. The cost to excavate the ground is about $2800. I get some discounts from the manufacturer and Black Haak for being a parade home. My total cost will run about $22,000. Its a difference of $10,000. Currently there is a 30% tax credit until 12/31/2016 on the entire project. The company that I got the quote from is Black-Haak heating and cooling. They have an engineer working for them who reviews the building plans, does the heat calculations and determines the size of the unit. Its critical that the right sized unit is installed. This requires that engineer to calculate it for best results, not just an estimate by the HVAC technician. They also have a computer program that calculates cost savings per year. Mine was estimated to be about $950/year in savings for heating, cooling, and hot water costs. For new home construction, installing geothermal seems like a no brainer to me. Its a great investment. By going with geothermal, I will save on my heating, cooling and hot water costs, use a free source of energy from the earth, and save on maintenance costs. My pay back will be within 5 years (closer to 3-4 years given my cost estimates). Sounds like a great investment to me and I am going for it. For what is known as a retrofit (an older home) the payback would be closer to 7-10 years. Below are links to the heating company that I will be using, which is very reasonably priced, and to Geocomfort which is the company that makes the geothermal heat pump. OK blog followers--Lets face it Rory would have been proud of my venture into an HVAC discussion of geothermal. He was a HVAC man himself and would have been excited about installing geothermal too. A future blog post will discuss solar electric. Its been a challenging week. Its that in between time of year here in Wisconsin. We are anxiously waiting for warm breezes, the songs of the birds, the smell of moist earth, and the pushing through of the flowers and grasses from the ground...and yet it feels like it will never happen! Snowstorm on 3/22! I dug my car out of the snow before going to work for what seems the millionth time this winter (even though by the calendar its supposed to be spring). Its also been a week where I am faced with the fragile-ness of life. I have heard of several people dying this week that I was acquainted with. The numbers of the dead in Japan from the quake and tsunami keeps on growing. My brother in law in Seattle discovered he had cancerous mass on his pancreas last week, underwent a 10 hour surgery called the Whipple procedure, and is on a ventilator in an ICU there. The fundamental questions of "Why I am here? ", "What is it all about?" come to mind. So for me, part of it is caring for life, caring for the earth, and being compassionate towards this planet that we call earth and the people in it. Faced with our own mortality and limitations, we can either give up or we can do our part to change what we can, to leave a legacy for the next generation. In what now seems to be my grand scheme of building a house, it seemed reasonable to build it green in the best way I could as a way doing just that. Its a many layered process. A big part of the process for me is making the house Energy Star certified. Energy Star is a national program. Each state has its own certification process and credits that can be earned. Here is what it's website (http://www.energystar.gov/) says: " To earn the ENERGY STAR, a home must meet strict guidelines for energy efficiency set by the U.S. Environmental Protection Agency. These homes are at least 15% more energy efficient than homes built to the 2004 International Residential Code (IRC), and include additional energy-saving features that typically make them 20–30% more efficient than standard homes." So the focus of the program is on certifying new homes to be energy efficient. An outside consultant who is involved in the Energy Star program does the certification. They make site visits during the building process. First, they review the building plans to determine the efficiency in the design. They make site visits during the framing and insulation portions of the building process. Finally, they do performance testing for air tightness, ventilation capacity, and verify combustion safety. There is cost involved for the builder and homeowner (roughly $800-1000 for the homeowner), but rebates are earned for putting in the extra insulation, and completing the assessment. This first step in building an energy efficient home (before using alternative sources of energy) is to build a tight envelope to the house. This flip side to this is that this sometimes results in poor indoor air exchange, and usually an air exchanger is added in to the house. I am also having the house Green Built certified. This is a Wisconsin program. (http://www.greenbuilthome.org/). Its aim is to promote energy efficient homes and buildings that minimize the impact on the environment. The cost for certification is $150. To qualify for a green built home, each home must earn a total of 60 points or more in a number of specified areas. First and foremost, the home must be Energy Star certified. Points must also be earned in the following areas: siting and land use; landscape conservation and stormwater management; energy efficiency; materials selection; indoor air quality; plumbing and water conservation; waste reduction, recycling, and disposal; builder operations; and efficient use of space. For instance, under the efficient use of space, although I won't earn points for having a house under 2500 square feet, I can check off 2 points for having a home designed for flexibility to allow for changing uses in the future, 1 point for having a home that shares a common driveway with at least one other building (my neighbor), and 1 point for having a bonus room over the garage. If my home was under 1500 square feet, I could earn 5 points. The checklists are quite extensive, and you can learn alot about green building by reviewing them, so check out the website. (If the pictures don't show up, then click on the the little box). My mom recently viewed the house. She said, "I always told you to tear down your old house and build a new one. I never imagined it would be a palace!" ﻿ Below are two of the cultured stones I am debating about. Opinions welcome.